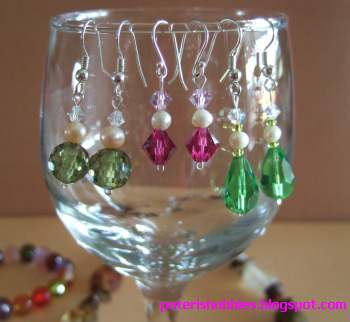 Sterling silver, crytals and pearls go really well in these ear rings. 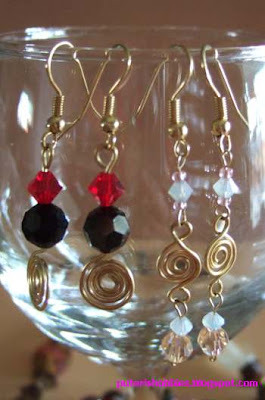 My first attempts at using wire in jewelry. I bought some craft wire to practise with and also some sterling silver once I feel I am ready for some wire jewlery. 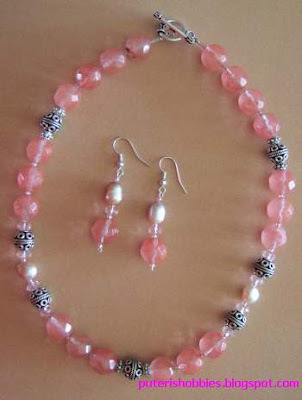 I used pearls, crystals and silver to go with this melon quartz necklace. Melon quartz is such a pretty color. I don't know what the stone is called but I think it is very beautiful. 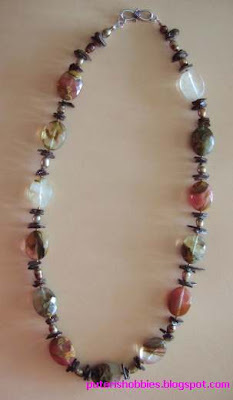 I matched the stones with pearls and shell pearls for this necklace. I also made a necklace using the same kind of stone which were slightly larger and angular cut but unfortunately I forgot to take a picture of it before I sold it off. Instead of pearls I used swarovski crystals. Today the kids are back in daycare/preschool. For the first time in many months I am in an empty and quiet house. I am still finding my routine! There are so many things I need to catch up on. How did I spend the first hours? I cooked myself bacon and egg for breakfast. Then I picked up a fun fur scarf I started last winter and finally finished it off. Heheh. After that I made a pair of ear rings. I have so many new beads that I don't know where to begin! What about my sewing? I bought a few pieces of material last fall and I am actually eager to start sewing. I received praise for the dresses I made last year and while I was in Miri actually made two identical dresses - one for myself and another for my friend, Esther. Actually my good friend Kheng Hua, who is an accomplished seamstress, helped me with the two dresses. And then there's the quilting. One of my regular clients dropped off three quilts a few days ago. I have to get back to quilting but my studio is too cold right now. There are also a few other things I need to get for my quilting machine before I can actually start. The canvases on the three rollers need replacing, and I have actually bought one of them. I still need to order two more pieces of canvas, though. Yesterday I went to a Beauticontrol products demo at a friend's house. Each of us present (7 ladies) got to try some of the skin care products. I enjoyed the session and all of us ended up buying some product or other. But I went a step further. I signed up as a "consultant" for the company. I am not one to do multi-level marketing. I have done a few previously but have never been motivated enough to really go all out selling and recruiting. The main reason Beauticontrol appealed to me, apart from the excellent products, was that as a member I only needed to buy $100 worth of products every 4 months, a lot less than what most MLM companies require of their members. I can safely assume that in 4 months I will need to replenish the products that I am using, and also my friend, Kathy, says that she will buy from me, so that helps the cost sharing. Back in Miri, one of my sisters-in-law, is using the SK-II skin care line. I see the improvements in her facial skin and was impressed by it. I found out that SK-II is available online and thought I would like to try the product despite the higher prices compared to other skin care products. But at the Beauticontrol session yesterday, after trying out some of the skin care products, and the reasonable prices to the items, I was sold. Why spend big bucks if what costs less works the same? As one ages, one notices that one needs to do more to keep and maintain a youthful appearance! We are at Hong Kong International Airport waiting for our connection to San Francisco. The flight from KL was so so with a few bumpy patches. Our three night stay in KL was mostly spent at Times Square. Times Square is a really huge mall and there are many restaurants there. I wished I had more time there so I can at least try as many restaurants as possible there! :-) Among the things I did, besides trying out the different restaurants, were an aromatherapy massage, a shampoo and blow dry, and a manicure at a salon. Doug was left to mind the children in the room. We are really looking forward to sleeping in our own beds and in our own rooms. The kids have been saying "me want to go home" for the last few days, at least more so since Daddy arrived to fetch us home. Looking forward to blogging more regularly once I get home!